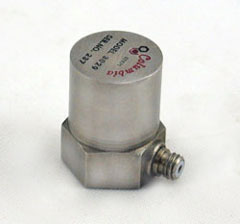 The Models 3029 and 3033 piezoelectric accelerometers exhibit a nominal transfer sensitivity of 100 picoCoulombs/g and may be used without auxiliary signal conditioning to provide an economical and reliable means of vibration measurement. The internal construction of the piezoelectric seismic system ensures that the units have no discernible spurious response to mounting torque, body strains, cable vibration, cable whip, pressure variations and most heat transients. The Model 3029 is epoxy sealed, and the Model 3033 is hermetically sealed to provide maximum protection against high humidity environments. Signal ground is connected to the outer case of the unit. Both units feature a 10-32 side connector and are provided with a 10" low-noise coaxial cable. High temperature units will operate in environments up to +500 Deg. F.